Once again it's time for our Year in Review series. Here, Danielle Desmond, our lead music selector and CD standing order expert, tackles the best of 2011's music. I can’t give Adele all the credit for 2011, though. Katy Perry’s sophomore album, Teenage Dream, tied Michael Jackson’s Bad for most number one hits on one album, and Billboard named Taylor Swift Woman of the Year. Rihanna, Bruno Mars, Lady Gaga, Justin Bieber, the Black Keyes, and Florence + the Machine all topped the Billboard Charts in 2011 as well. Moving from the charts to the arenas, 2011 also marked the year of unforgettable tours. From U2’s 360 and Bon Jovi to Taylor Swift and Lady Gaga, this year proved to be quite a year for concerts. So much so, in fact, Randy Phillips, president and CEO of the world’s second-largest promoter, AEG Live, called 2011 “the biggest year in the history of the company” (Billboard Magazine). The tour I am anticipating, though, happens to hit in 2012—the rumored Beach Boys 50th Anniversary Tour. Moving onto children’s music, our little listeners don’t know how good they have it. Kidz Bop 20—an album of kid-friendly renditions of hot hits from the radio, performed by young performers—was a big winner this year amongst the kiddos. 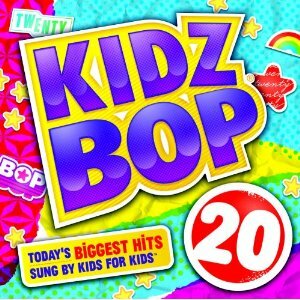 So much so, that it earns my recommendation as the most family-centric album of 2011. Other albums that were huge this year for children include Disney Princess Fairy Tale Songs, Disney Lullaby Album, Dan Zanes’ Little Nut Tree, and any of the Rockabye Baby Lullaby Renditions. I’m sure all of the aforementioned titles made many car trips easier and definitely more enjoyable for both parents and children. A surprise this year was the breakup of Rock and Roll Hall of Famers R.E.M. After 31 years of unforgettable music, they said goodbye. However, they didn’t leave us empty handed. The band released a two-disc greatest hits album, Part Lies, Part Heart, Part Truth, Part Garbage, in November. I believe the old saying is when one door closes, another opens, and this is exactly fitting for the music industry that had chart-topping breakout artists arise in 2011. Country music band The Band Perry’s hit “If I Die Young” played on pop and country music radio stations over and over again, earning the brother-sister trio nominations at the American Music Awards for Country’s Favorite Album and Favorite Group. Indie pop band Foster the People had everyone whistling their ever-so-clever tune “Pumped Up Kicks,” which was very popular on NPR.com and charted on the Billboards almost instantly. So which breakout artist should you be on the lookout for 2012? I’d say Yelawolf, James Blake, Christina Perri, JCole, Katy B, Civil Wars, and Lana Del Rey. Moving onto Broadway, 2011 marked a major year for new cast recordings. From Godspell to Anything Goes, Midwest Tape has all the Broadway musical soundtracks., including the new smash show The Book of Mormon. Written by South Park creators Trey Parker and Matt Stone, The Book of Mormon hit NYC in March of 2011 and has since won nine Tony Awards. ‘‘These [musical] numbers are witty, ridiculous, impeccably executed and genuinely stirring,” said Ben Brantley of The New York Times. It’s definitely a musical that will have you crying—tears of laughter, that is. And now let’s remember 2011’s biggest musical meme: Rebecca Black. Remember her? Who doesn’t? “It’s Friday, Friday. Gotta get down on Friday!” Okay, that’s enough of that. Makes you wonder, though, what musical meme will match that of Black in 2012. Moving now from the interwebs to television: American Idol had two challengers this year, and I am not talking about Dancing with the Stars. The hit program on FOX wasn’t the only show that had America calling into vote. NBC’s The Voice premiered in April with hot celebrity judges Christina Aguilera, Cee Lo Green, Adam Levine, and Blake Shelton. And FOX's The X Factor premiered this past summer. Both The Voice and Idol provided America with new talents such as Scotty McCreery (American Idol winner), Javier Colon (The Voice winner), and Dia Frampton (The Voice runner-up), all of whom have had successful albums released this year. The X Factor's winner, Melanie Amaro, nabbed a $5 million recording contract with Syco Music and Sony Music, the largest guaranteed prize in television history. Her album is slated to release in 2012. The Voice returns to NBC on February 5 after the Super Bowl, while American Idol premieres January 18. Some TV critics are wondering, though, with the successful debut of Simon Cowell’s The X Factor and The Voice, will American Idol still be a fan favorite? Look out Glee! Because the musical TV show I’m predicting will be a hit for 2012 is Steven Spielberg’s SMASH, starring Catherine McPhee from American Idol, Debra Messing, and Angelica Houston. SMASH takes place in New York City and is based around a group of actors putting on a new Broadway musical. SMASH premieres on NBC February 6. Watch the trailer below. The Rock and Roll Hall of Fame added a few members to their family. Inductees for 2011 included Alice Cooper, Neal Diamond, Dr.John, Darlene Love, Tom Waits, Jack Holzman, Art Rupe, and Leon Russell. In order to truly appreciate this year in music, we have to remember those whose talents we’ve lost. The music industry mourned the death of talented singer/songwriter Amy Winehouse. Amy passed away on July 23, 2011. Winehouse was the first British woman to win five Grammys. Her last album Lioness: Hidden Treasures was released on December 6. Yes, we have heard a lot in the world of music this year. Most of whom we hope will not go way in 2012. I know I’m hoping to fill my music collection with more Adele, Florence & the Machine, Nicki Minaj, and Lana Del Rey (watch her new single "Video Games" below). Well, that’s my music recap for 2011, and 2012 it is just around the corner! What new music and tours are you hoping for this year? excellent article! well written and I luv luv luvvvv the rebecca black shoutout!